What do you mainly use your horse for? "....I would highly recommend Nick to anyone....he is very supportive and encouraging but also experienced and knowledgeable...."
I enjoy and derive great personal reward from teaching a wide range of horse and rider abilities from beginners to those competing at affiliated level. 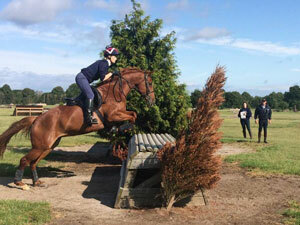 The emphasis is on inspiring the rider and building confidence in both the horse and rider. I have ridden and competed from an early age. I have showjumped to Grade A; schooled leading show hunters; re-schooled ex racehorses; trained on the flat and over fences with international riders and coaches. I can travel to clients throughout the North of England and the rest of the UK; I am perfectly situated in West Yorkshire to travel in all directions and have built an excellent working relationship with a number of Pony Club branches teaching at their weekly training sessions, rallies and camps. I teach and coach on the flat and over jumps and will deliver private, semi private or group lessons. I will be pleased to deliver any combination of separate sessions from one to a number of sessions, over the course of a day or several days, in order to meet the needs of the client. I can also deliver clinics in all major disciplines. In addition to helping with general equine matters, I can help you source appropriate horses to meet your requirements and help you sell horses to suitable buyers. I also commentate at British Eventing, British Showjumping and FEI events; I would be pleased to discuss your requirements for any equine related event or show. Copyright © 2010-2015 Nick Wood Equine. All Rights Reserved. Designed by Black Ram Web Solutions.